The wife of a crew member onboard the missing Argentine submarine and others slammed the quality of the vessel. The submarine has been missing for more than a week. Officials said that an apparent explosion occurred about the same time the submarine went missing, according to the country’s Navy. 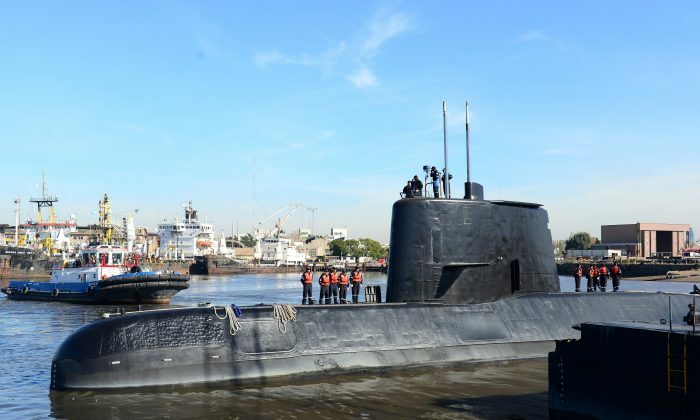 Navy spokesman Enrique Balbi maintained that the search for the missing submarine will continue. It disappeared hundreds of miles from Argentina’s east coast before contact was lost. “They lied to us … they have been dead for a while, and they had us here a week ago,” she said, adding that they “are angry” with the Navy’s alleged lack of transparency. The search for the submarine has prompted an international search-and-rescue mission. The German-built submarine was commissioned in 1985, but it got a $12 million retrofitting in 2014. On Thursday, officials said a U.S. plane found an unidentified object in the water where it went missing. We have a small favor to ask of you. More people are reading NTD TV than ever, but ad revenues are plummeting across media websites. If you can, please share this article on Facebook so you can help NTD. It takes less than a minute. Thank you very much!